Officers: Launcelot Fleming, Mark Hayden, Eddie Stuart, Jim Turner, Ric Weightman. Rory Post, Dickon Sandbach, Michael Strachan, Steve Stuart, William Warin, Andrew Wordsworth. By the time the main party had left York on the way north we had already managed to lose two members of the Expedition, and I had visions of arriving in Mallaig to greet the other officers with the news that everybody else had been 'lost on transit'. Fortunately Rupert joined us at Glasgow, and it was later discovered that the other missing member had been taken ill the day before and was unable to come. It was thus in a relatively peaceful state of mind that we disembarked from the Loch Arkaig at Kinloch. Having made three trips from ship to shore we were all assembled on the jetty and with two tractors with trailers waiting to transport us to the site at Salisbury Dam I was just beginning to congratulate myself on a superb piece of organisation when the unexpected happened. The midges attacked! Now all those who have been to Rhum or anywhere else in the Hebrides will immediately say that midges are very far from unexpected. Be that as it may: by some extraordinary piece of mismanagement we arrived to set up camp on the worst evening for midges of the entire summer season on Rhum. In addition to this I later learnt that 1971 has been the largest and most plentiful midges ever recorded and that Rhum was the worst place of all (Nature Conservancy Report). Throughout the entire Expedition, and in particular during the first week, we had to endure vast numbers of these little flying friends at quite literally all hours of the day and night. Thanks to Steve Stuart for the photo. Despite this very considerable handicap the Expedition went extremely well. Rhum itself is probably the very best of all Hebridean islands in that within its 26,400 acres one finds a remarkable variety of landscapes ranging from the mixed woodland of Kinloch and the beautiful sands at Kilmory to the extensive moorland of the area round the camp-site and the extremely rugged 2,500 ft. mountains of the south-east. We fished, walked, drew, surveyed, climbed, went on bivvies, practised Egyptian PT, and wrote poetry. Most important of all we did a large amount of project work, details of which will be found elsewhere in this report. Ric, our tame geologist, Look everybody out rock-spotting at leant once and built up an impressive collection of all the major rock types of the island. Jim went on many 'geomorphological rambles’ to explain the mysteries of glaciation. Mark went climbing when the mood took him. We were all sorry when he had to leave early. Eddie surveyed the stream around (and on some occasions very nearly through) the camp-site, and produced a very fine map of the Harris area which provided the basis for much project work there. In addition, he was misguided enough to accept the malicious suggestion of Mark and myself and attempt to ascertain the exact height of Trollaval which was then thought to be unknown. Having been forced to leave the theodolite on the summit it was finally retrieved, at the third attempt, on the last day of the Expedition. Alan persuaded others to draw and paint as well as acting as editor and scribe for our very own newspaper. David took meteorological recordings and failed to provide a reliable 'midge forecast’. Rory spent his days watching the oystercatchers and other 'birds' at Kinloch, often accompanied by Rupert. William worked on mosses. Steve and Bob, amongst others, on their poetry. Space forbids any mention of the other members of the Expedition, but I know that they all did a great deal of project work judging by the number of articles which I have received. I fear that there will not be room to print them all. The most memorable thing about the Expedition was the 'ethos' surrounding it. Partly explained by the small size of the Expedition and the poor weather, it was also due to the hard work and good (or possibly bad) humour of all concerned. Memories of the rain and gales, of the storm-watch, of Bob's cartoons, or Rhumidge, of Launcelot's all too short visit and the Communion Service which he took, of the search-party sent out to look for Eddie, of our rehearsal of the Ritual which we were never able to perform, of late nights spent writing poetry, bathing people's blistered feet, singing and eating 'Healthy Life' biscuits, all flood back in a revolting plethora of nostalgia. Our guided tour round Kinloch Castle on the last night provided a suitable finale to a successful, though exhausting, Expedition. On a slightly less euphoric note I must conclude by saying that if the weather had been kinder and the preparation more thorough we might have done considerably more project work. The Site itself, despite its central location, was not good because it was situated right in the middle of a rather uninteresting midge-infested piece of moorland. Finally, I must thank Peter Wormell, George and the whole Nature Conservancy Staff both on the island and in Edinburgh for all their help and advice which contributed so greatly to the success of the Expedition. Webmaster 3/08/2017: I don't as yet have any more photos but I am hopeful some may materialise, but I have had contact from several of the members of this expo. over the years. First is a message from Nick David (which if I'm not mistaken, is the brother of Stephen David who was an officer on my first ever SHS trip, N Uist). Scondly a lovely article from Rob Marchment recalling his memories of this trip, finally a note from Eddie Stuart confirming the expedition that the photo was from, taken from the Facebook page. It was great to stumble across the SHS website recently. I too have searched google in the past without finding much so I am very pleased that you have made this website. 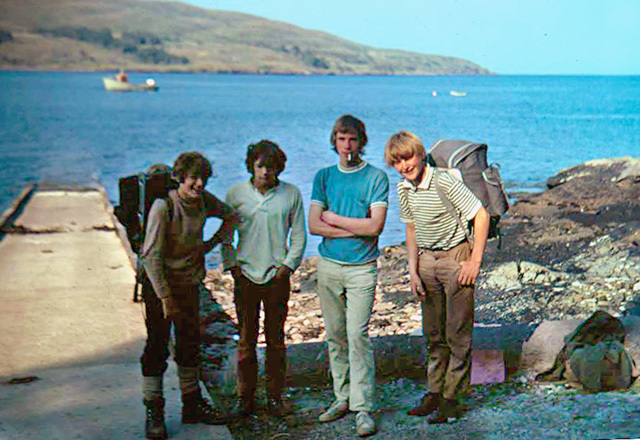 I went on 3 expeditions: Colonsay 1969, North Uist 1970 and Rhum 1971. Phil Renold was leader of the last 2 (as well as being an officer on the first) and I am sorry to hear he is no longer with us. Unfortunately I don’t think I have any old photos. My 2 older brothers also went on expeditions; Christopher was on Colonsay 1967 and South Uist 1968 if my memory is correct and Stephen went to Harris, Rhum, Mingulay and possibly others but I don’t know the years. We came to know about the SHS as my father was a teacher at Stowe school at the time and some of his colleagues were involved with it. I remember some great times as well as hardship at times such as trudging for miles through horizontal rain but it certainly gave me a love of Scotland which has never died. I now enjoy a sailing trip in the western isles each summer. I’ll keep an eye on the website for any updates." It may be forty-six years ago but, when bidden, the memories return with an almost disturbing facility. Images come first, quickly accompanied by related emotions, then faces, specific characters, snatches of conversation and, lastly, certain sounds. The sound of Rhum. And what were these sounds? The wind, on occasion. Perhaps rain – definitely! Birds occasionally. Human speech, in all its variety – laughter, shouting, the expression of interest, humour, annoyance, exhaustion. I know I visited this island twice. Was the first occasion in 1969? But, certainly, I went again in 1971. So, what I recall may be a merging of the two visits but if such a mingling is only of an impressionistic nature and not anything factual, then I ask forgiveness. The images that come to mind, therefore, are these. I see the experience of the ferry dropping anchor in the sea loch and our precarious journeys, back and forth, by motor boat to the shore. The backdrop for this strenuous and unwelcome exercise was the curious and eerie form of the famous hunting lodge, built by the wealthy owner of this most individual of islands. Then, and I presume this is one of the commonest elements in the collective SHS memory, the trek to wherever the base camp was to be. The hauling of gear and tackle of every shape, type and weight. Sometimes we were aided by a tractor and trailer, but the intervening years have blurred this fact into possibly therapeutic wishful thinking, with the reality being more like a long, hard series of slogs. Metamorphosis is the next phase. That is, the creation of a camp, complete with a main marquee, group tents and all the rest of it. And how was it that our furniture and living space, crafted out of wooden items salvaged from the savage seas, would become objects of such familiar welcome and comfort. So much so, that to finally be parted from these rough-hewn artefacts, at the end of any expedition, was a wrench indeed…? I recall the various ‘space walks’ we all carried out away from the base camp. The day-long journeys to the coast, or down to the settlement at the sea loch, or to visit the incongruous mausoleum of the long-gone landowners, striking in its Greek temple style. Then, there were so many of those conversations that we seem to remember the taste and flavour of, if not the actual words. Some were enjoyed in the comforting glow of a Tilley lamp, quietly hissing and warming the after-dinner atmosphere that followed each evening meal, along with a seemingly heavenly mug of cocoa. Other exchanges took place on any of the long, long walks we undertook on an almost daily basis. One of the leaders once told us a ‘shaggy dog’ story that lasted for the duration of one of these ‘strolls’ up from the sea loch. I can recount it even to this day, but decorum prevents me from doing so here. And if the teller of that far-off tale is reading this, then he shall know that it featured the wearing of a certain magical sock…! But enough of such dangerous digressions. It was on this expedition that we took part in an improvised, but historically accurate re-enactment of a Viking raiding party encountering the Pictish locals. This was huge fun to be involved in. The expression “Up yours, you Viking bastards!” still resonates down the years with all its original ferocity and humour. Strangely, I am now the occasional storyteller – or skald – with a local Viking re-enactment group. I wonder where the inspiration for this came from…? There were other activities, such as the visit to that imposing hunting lodge, where we were entertained to afternoon tea in the company of what seemed like hundreds of stags’ heads on display in the main hall. However, beneath all these postcard-pictures of the many experiences we had, there lies that one unpredicted event that underscores my days even now. It was not anything created by humankind, nor was it the work of a creature that runs, swims or flies. But we witnessed it and it may haunt us positively still. It was, seemingly, just another bivouac. A two or three-day jaunt away from the main camp. A few of us, and one leader, walked over the mountains in a south-westerly direction. These treks were always a physical challenge for me and only now do I understand why. I had been born with congenital heart failure, expressed in my particular case with a narrowing of my aorta. This condition was not diagnosed until I was forty and thanks to two subsequent and major surgical interventions I am now able to be writing these recollections. But at that time, on those rugged slopes of the hills of that distant island of Rhum, I knew only the effect of my heart struggling to cope with its constricted and limited geometry. And, unbeknown to me, what we went on to encounter, had an even more personal and significant meaning than I could have realised at that time. We finally arrived at the bottom of a steep valley that swept down from the mountains and straight into the sea. There was a series of sea chasms that seemed to have been cleaved out of the living rock by the huge axe of some mythological Celtic god of the sea. As the afternoon wore on, we made camp. The task of preparing the evening meal fell to me, whilst my companions went off to explore the shore and take a dip in the sea. And, as you might have guessed, the local midges, in their maddening millions, came to visit and pass the time of day with me. My fellow bivouacers returned to the sight of me clad in an anorak, a balaclava and a snorkelling mask in a vain attempt to keep these dainty demons at bay… But all to no effect! After the usual long and winding conversations, we all slid slowly into a welcome slumber, lulled into sleep by the exertions of the day. But then, I realised, there was something more occurring. It wasn’t just the strange sensation of sleeping on a slope that angled us precariously down the sea, it was a sound, an initially unknown sound that was suffusing and surrounding us. It was the sea, that much was certain. But it was the sound of the sea that was rushing into those deep-cut chasms with such force, with such power and such absolute dominance. Hiss, crash, boom… Like some mass exhalation, then a huge collision followed by that deeply resonating heartbeat. It was the heart of the sea, of the earth, of us all that I could hear, thrumming right up from the chasm floor, through the valley and on into the mountains above us. And in addition to his railway exploit above, Steve (my brother) also lent far enough out of the carriage window at the start of the journey home to shake the hand of the Mallaig signalman who had just given the token to the train driver! !